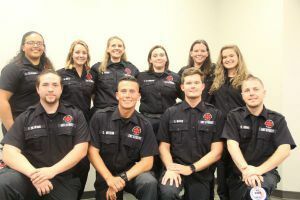 Ten Pensacola State students received their Emergency Medical Technician patches during a ceremony held Wednesday, May 10, in McMillan Auditorium on the Warrington campus. Deanna Adams, Shelby Crawford, Kayla Cushing, Francisco DeJesus, Chandler Hersom, Charles Marek, Ariele Metz, Richard Rowe, Annette Steinhaus and Brittany Turner were recognized. Jason Chaney, a 1999 Pensacola State EMT graduate, was the keynote speaker and Francisco DeJesus delivered the student-address. Dr. Mark Stavros, Emergency Medical Services Program director, administered the EMT Oath to the graduates. Deanna Adams was presented the Academic Award, with Shelby Crawford receiving the Clinical Award. Lt. Jenny Connell, an adjunct professor, received the Instructor Award. Other Emergency Medical Services Program faculty members include Sgt. Niels Andersen, Senior Lt. Ray Winstead, Capt. Tim Cole, Capt. Bill Halfacre, Capt. Don Lee and Capt. Steve White. Rebecca Brownfield, program director for the Nursing and Emergency Medical Services, served as the master of ceremonies.